Even though I have spent three years at a sports-orientated university, forms of exercise where I can actually socialise comfortably with those around me have been sadly lacking. Before I hit puberty, I swam regularly with friends and family. One of my favourite treats was to go to a local outdoor pool in the summer. Unfortunately my discomfort with myself began to hamper that. Once I began my transition, any form of indoor sport where I’d have to use a changing room became problematic. Before I changed into my exercise gear, I would get questioning looks on my presence in the ladies. But using the gents has always felt out of the question. Poor experiences in bathrooms meant I certainly wasn’t going to strip off in a male-gendered space. So I withdrew from engaging socially and, though I adore my solo sports, I was lonely with it. Attending the first Seahorses group was a bit nerve-racking. I hadn’t gone swimming in 6 years at that point, I felt like my fitness levels had plummeted. I spent an age trying on different combinations of swimgear to find some comfort. I almost didn’t leave the house that Sunday. But I did and I haven’t regretted it for a second. Going to Seahorses has given me back something I didn’t really know I was missing: the support of community in sport. I stepped into a changing room without external fear and I socialised with a group of people of all ages, identities and body types and where no-one made assumptions based on my own body. Not only could I exercise but I was able to interact without shame with the people surrounding me. That was something beautiful and liberating. 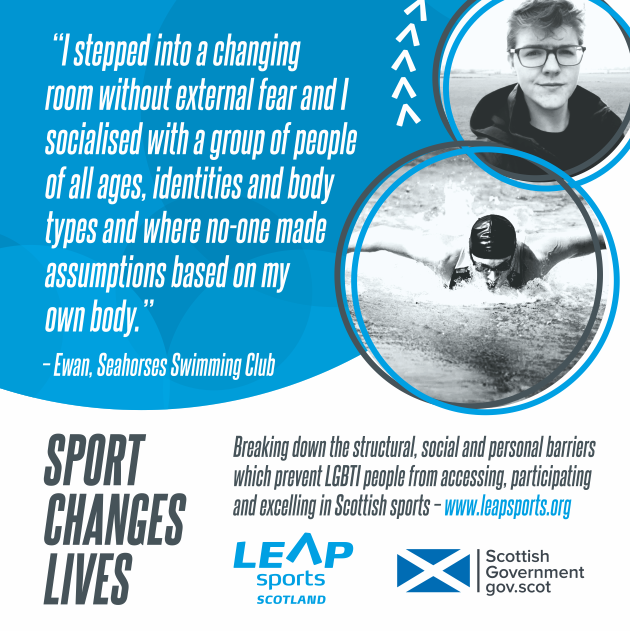 Seahorses was founded in 2016 as Scotland’s first dedicated swimming club for transgender and non-binary people. Everyone is welcome whether serious about swimming or just enjoying a splash around. We ensure that staff in the venues we use have been trained in trans awareness. Check out our Facebook page for up to date times, venues and dates. Written on 8th January 2017.